Fluid Imaging Technologies receives the Innovator of the Year Award. Addie Suckow, Hunter McGlauflin and Matthew McLean of the the Saint Dominic Academy robotics team, the Saint Dominators, explain the workings of their robot prior to the annual Maine Manufacturing Summit at Lost Valley in Auburn on Friday. 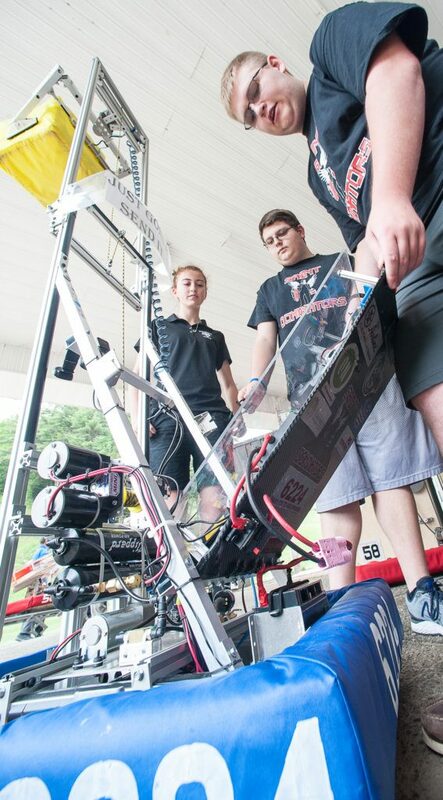 Manufacturers are hoping students interested in topics like robotics will make up the next generation of innovators and manufacturers here. The average age of a Maine manufacturing worker is 59, he said. Part rallying cry, part celebration, the Manufacturers Association of Maine held its annual Maine Manufacturing Summit at Lost Valley on Friday. Fluid Imaging Technologies received the Innovator of the Year Award. That company started 18 years ago in a rented East Boothbay garage and now does all of its production in Scarborough with 30 employees. President and CEO Kent Peterson said companies use its technology to analyze algae, food ingredients and cancer cells. Accepting the Manufacturer of the Year Award, Paul Meserve, vice president of Saunders Electronics, said that high-tech company has 65 employees and a 35,000-square-foot factory in South Portland. “We’re all over the place, but nobody knows it,” he said. In January, the Maine Wood Products Association disbanded and encouraged its 75 members to merge into the manufacturers association. Roland, who had been president of the wood products association, said the group realized that its work and the manufacturing association were duplicating a lot of efforts. In a nod to that, the manufacturers association gave two wood products industry awards Friday. The Pine Cone Award for a small manufacturer went to Maine Cedar Hot Tubs of Skowhegan, and the other Pine Tree Award for a large manufacturer went to Lie-Nielsen Toolworks of Warren. “I love making things, I love making high-quality things, I love getting paid for doing that,” said owner and founder Tom Lie-Nielsen. Before the summit wrapped, the 200-plus manufacturers in the room were asked to commit to at least one action point to help lift the industry. • Having students come to tour on Maine Manufacturing Day to see the work they do. • Consider job applications from new Mainers, those leaving public assistance and people coming out of the corrections system. • Getting involved with the association’s new Business Retention and Expansion study. • Calling legislators and testifying when they hear about bills that will affect their businesses.